After a good and restful sleep, we lazed around in the morning, went for another nice walk, stopped in to the local bakery and picked up some bread.... No croissants, darn!! We fueled the truck up and headed direction east. Before long we entered the province of Ontario. Stopped in at the tourist info center and picked up some pertinent information. Got to get all the tourist info. Kenora and Lake of the Woods are next on the agenda. Lake of the Woods is the most intriguing lake and is like no other. This lake has over 14,000 islands (yes you heard right, fourteen thousand), over 105,000 km of shore line, and is 4,348 square kilometers, just incredible. Lake of the Woods occupies parts of the Canadian provinces, Manitoba and Ontario and the state of Minnesota in the USA. This is the ultimate place for the outdoor enthusiast. Fishing, hunting, boating, house boating, and more are just some of the things you can do here. We hope to come back through this area on our way back and spend some more time here. As we head east, we set the GPS for Sandbar Provincial Park. 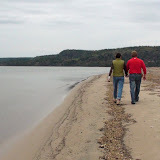 Sandbar has a wonderful sandy beach and is the largest of 10 lakes in this park. Great fishing with lots of Walleye (also called Pickerel). The campground is great with pull through sites that offers electric and water at the sites and with a common sani-dump. Showers and laundry are available and the washers and dryers came in handy. Continuing our journey through the woodlands of Ontario. Totally amazing and beautiful. After several hours of driving we get closer to Lake Superior and make a side trip to Kakabeka Falls. Kakabeka Falls is known as the Niagara Falls of the north. The falls plunge 40 meter or 131 feet over the rocks including some of the oldest fossils in the world. We did not stay in Kakabeka Falls Provincial Park, but it has some great reviews. Later we arrive in Thunder Bay at the northern shores of Lake Superior. Thunder Bay gets its name from the big bay at the top of Lake Superior called "Thunder Bay" or "Bay of Thunder". Thunder Bay is a very important harbour and a lot of the grain grown in Manitoba, Saskatchewan and Alberta is shipped out of Thunder Bay. Lake Superior is the largest fresh water lake in the world. It really feels like you are on the shores of an ocean. How about this for a fact: There is enough water in Lake Superior to cover North and South America with one foot (30 cm) of water. We left Thunder Bay after a brief stop where we paid tribute to Terry Fox at the Terry Fox memorial. This is where Terry had to give up his quest to run across Canada, his cancer was back. This Canadian Hero of ours raised over 20 million for cancer research. Our next stop was Neys Provincial Park. This is a wonderful park on the shores of Lake Superior. A walk on the beach before supper. Prisoners Cove in the back ground. Neys Provincial Park was once a prisoner of war camp during the Second World War. From 1941 to 1946 hundreds of German prisoners of war lived here. Little security measures were taken to keep the prisoners at bay, because the hostile shores of Lake Superior formed a natural barrier. At the end of the Second World War, Neys became a processing camp for all prisoners of war. It was later turned into a minimum security work camp for Thunder Bay. This camp was dismantled in the mid 1950's, and in the mid 60's the area was designated a Natural Environment Park . Today, visitors can follow trails to the remains of the POW camp, building foundations, rusty barbed wire and look out over Prisoners Cove. Camping on Neys Beach in Neys Provincial Park on Lake Superior, Ontario. We set up camp here on the beach. Wonderful and well maintained. Electric and water hook up only, there is a common sani dump. Walking on the beach here was almost like walking on the beaches at home on the West Coast. 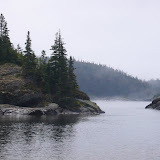 Pukaskwa National Park with its wild shore on an inland sea is a very magical place. The exceptional beauty of this park is revealed in its vistas of Lake Superior and the rugged, ancient landscape of the Canadian Shield and northern forest. We are sure the Group of Seven painted here or in similar places their beautiful Canadian landscapes. The spirit of the wilderness envelopes those who explore this special place. The park is home to a small herd of Woodland Caribou, which makes the park even more special. We happened to be in the park during the first annual Caribou Festival. It was great, we got to talk to the local park warden, many employees of this park are from the local Native Community. Pukaskwa is very mystical and leaves a lasting impression. Pukaskwa National Park is the only wilderness National Park in Ontario, Pukaskwa protects 1878 square km of an ecosystem that features boreal forests and the Lake Superior shorelines. Pukaskwa also offers camping for both RV and tents. Don't miss this park with its many hiking trails. We continued our trip along the grand lake of Superior and checked in to a campground just outside Wawa, called Wawa RV Resort and Campground. This is a great place to stop, a "Good Sam" member RV park. Very friendly and all the services are the way they are supposed to be. The campground is on Magpie River that flows into lake of Superior. Fishing anyone? Here is your chance to catch a good one right from your campground. Early to bed, this driving stuff makes us tired. Wawa's history is rich in mining, forestry and the fur trade. Many mining attempts began in the the late 1660's, but it wasn't until 1896 that gold was discovered on nearby Wawa Lake. This in turn led to a rush in the area. The population grew dramatically from a handful of people to approximately a thousand people. More on Wawa. Love your blogs! Great to see pictures of Kakabeka Falls. We use to live a mile down the road from the falls, so your blog brings back some fond memories. It seems like the weather is still winterish, whether you're on the West Coast or the centre of Canada! Keep warm and keep posting! More great photos and descriptions. Now you are in my home province of Ontario. You're right, it does look like the west coast in some places. I saw Kakabeka falls in the 60's while driving to Winnipeg for the Pan Am Games in a shiny new yellow Chevelle convertible. Nice to see the Terry Fox Memorial especially after all the news about his Mom's passing in the papers lately. Your hats and jackets tell the weather story. Summertime is just a song!